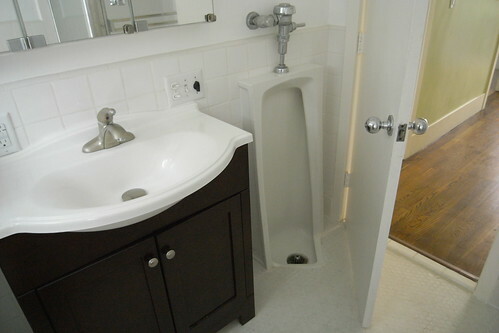 A vertical style urinal in a private bathroom. Curious introduction of a fixture normally found in a public “men’s room.” Made me think about the incongruity introduced between public and private space and the meaning of things when the thing moves into other contexts. Found in a home in Venice Beach, California. 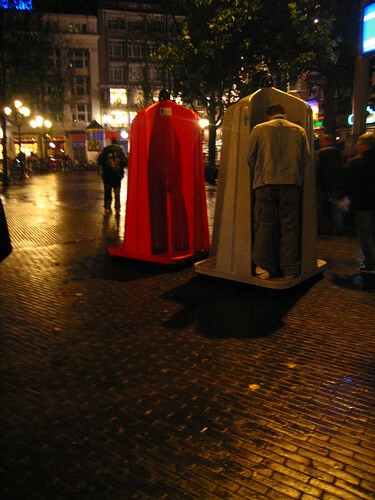 A private bathroom, introducing an element of the public with this urinal. Quite an incongruity, if you ask me. Why do I blog this? A curious artefact, the urinal. It is quite ordinary in one setting but clearly out of place (at least in my mind) in the setting of a private, residential bathroom. It’s almost like a prank or something. I have no idea why it is here, but there it is. What struck me most is the public ritual that is inferred by this fixture. You know what I mean. It’s a common ritual, everyone does it. Men do it in a particular fashion distinct from women, but nonetheless, it gets done. The full-length, stand-up urinal switches the context though. It does not seem to make sense in a private setting. It may in fact be more efficient (it’s hard not to be cheeky here), but it interrupts the sense of what this room actually is when found in a private home. Efficient means of managing farm animal behaviors. Weekend nights in Amsterdam, servicing the largely UK-based influx of brawlers. A confusing placement of toilets. The angles of the two urinal fixtures makes for an awkward bit of maneuvering and probably several moments of immodesty. Seen in Madrid, Spain. Neat. Orderly. Clean. Considered. 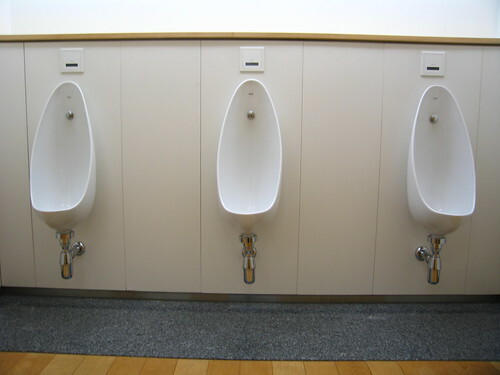 Urinals in Japan, with a comfortable spacing between stations, although no modesty wall. Tokyo, Japan. It makes me think quite clearly about the appropriateness of “the object” (in general terms, not just a toilet) and how much more “things” surpass their mere engineered utility. Things in themselves are not their function, which is obvious to me as a principle of design. In the most crass sense, things become styled to elevate or inflect their meaning to people. 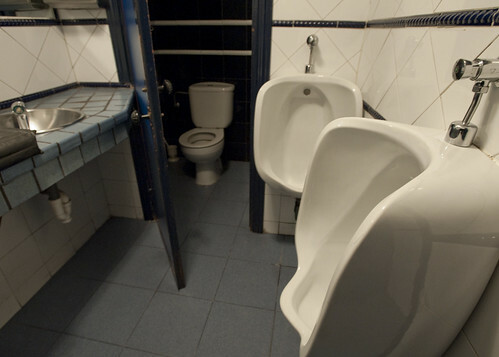 Urinals become horizontal troughs in some settings, which is closer to a refined sort of piss-pot for farm animals, which some men become when heavy-footed and heavy-lidded with drink. The horizontal piss trough means something distinctly different from the vertical urinal, and that again from the vertical with a modesty wall, and that again from the private stall. but so much more when exhibited in a bizarre incongruity. For example, telephones, or mobile phones, lets say, that do more then one would expect a phone to do and all of the effort that goes into inserting a new bit of functionality for the sake of the functionality. Consistent with their intent and the context of their intent, designed objects “work”. There are lines that can be easily crossed. That line is all about context and social rituals, not the sort of sense in which a very instrumentally-minded person might say — well, it serves a basic purpose, so what’s the problem? The conclusion for design is that one, as a maker of things must think carefully not only about the technical, instrumental bits, but also the normal, humans (who are more than likely not like you, particularly if you are an engineer) who will introduce this thing into their more everyday, quotidian settings. (I am thinking here mostly of the thing that is on my mind quite a bit — communications devices that end up being more like something an astronaut would use than what a normal, everyday person would introduce into their everyday practices of connecting to other people.) In this example of the toilet, it is clear that it is more than a instrument for flushing waste appropriately. This example will certainly do that, but design is also about context, and contexts of use and consideration of the setting in which such action happens. This bathroom becomes something else (closer to a public restroom? more crass? more suggestive of these other places, etc.) with this thing in it, for sure. A lot of guys with prostate problems put these in — I helped a great uncle with one, well-designed, tile, etc., for that reason. It is a little odd-looking, and the awareness of how it will look to people can keep them from doing it, even when it makes tons of sense given 1) how often you might have to go, 2) how inaccurately, and 3) how painful it is to crouch and clean up misses when you have certain procedures or conditions.